These days the world of video games is rife with crossovers of seemingly incongrous characters and franchises ranging from the very famous (Super Smash Bros) to the borderline sensible (the manga/anime crossover Jump Force) to the completely unexpected (it might seem par for the course now, but when the first Mario and Sonic at the Olympics game came out it blew everyone's minds!) 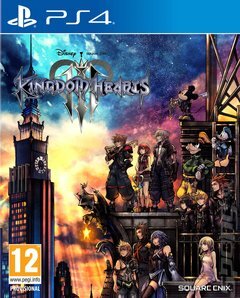 No-one has really committed to the idea quite so hard, however, as Square Enix and Disney with the Kingdom Hearts series. It began in 2002 and while we're only on the third mainline instalment in the series with Kingdom Hearts III, they've squeezed out a lot of 'in between' games (with some really weird titles - past highlights include the delightfully odd Dream Drop Distance and 0.2 Birth by Sleep -A fragmentary passage-) and extra manga/novellas/films over the years. There's no throwaway plot borrowed from comics involving some villain smushing dimensions together here. Rather, there's a deep backstory packed out with lore to dig into. In a nutshell, though, you play as Sora who, accompanied by Donald Duck and Goofy, is trying to protect multiple worlds from an invasion by the Heartless, an army of shadowy beings bent on shadowy deeds. Those worlds, though, include heroes from the likes of Frozen, Toy Story, Monsters Inc., Big Hero 6, Tangled, Hercules, Pirates of the Carribbean and more! All in all it's looking like a massive game, with director Tetsuya Nomura stating that one of Kingdom Hearts III's worlds is as big as the entirety of 0.2 Birth By Sleep. Gameplay-wise, Kingdom Hearts III builds on some of the more fun aspects of previous games, particularly when it comes to battles. Combat is a hack 'n' slash affair. Sora still carries his trusty keyblade for hand-to-hand combat and when it gets going the action comes thick and fast. The keyblade can transform and you can equip up to three different forms at a time. You might swap between, for example, the Tangled-inspired Mirage Staff Monsters, Inc.-inspired Twin Yo-Yos and the Toy Story-inspired Hyper Hammer to dish out devastating attacks. The most delightful way to lay the smack down on your foes, though, is with a Link. These are summons that bring in characters from across the world of Kingdom Hearts - Ariel from The Little Mermaid might swim onto the screen for a fountain-like attack or Wreck-It Ralph might stomp into your battle to place explosive blocks and wreck everything in sight! Kingdom Hearts III is, in essence, a crossover for the ages. Epic in scope, weird in tone and fast and furious in action, it's essential gaming for Disney and Final Fantasy fans.